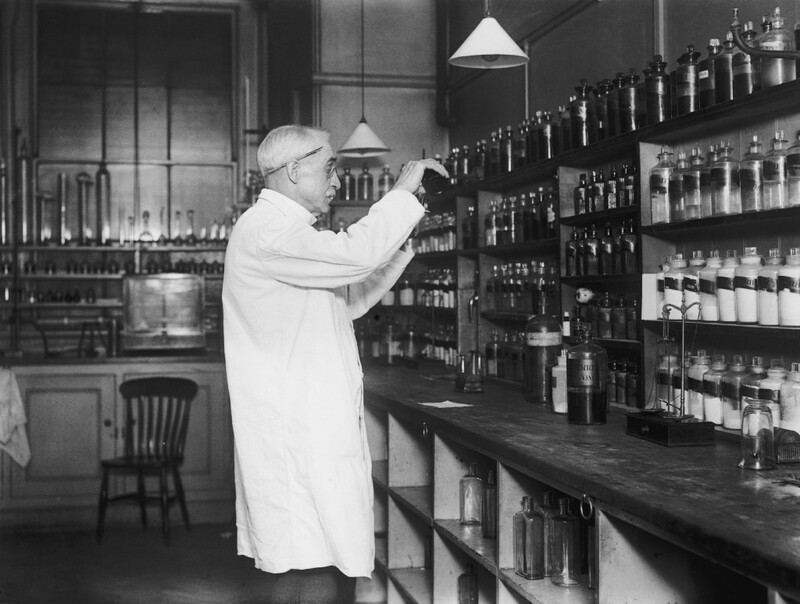 The people who fill your prescriptions used to sell poison. Henry Marchant came back from drinking with his mates at the pub. He asked his wife Charlotte for a cup of tea, drank it and went to bed. He soon woke with painful convulsions and vomiting. Seven days later, he was dead. On the day he was buried, Charlotte bought a marriage license. That Monday she married a wealthy 70-year-old man. When doctors examined Henry’s corpse, they found arsenic in his stomach and liver. Police accused Charlotte of murder. She was convicted and sentenced to death, but because she was pregnant, her sentence was commuted. A murder spree gripped Britain in the mid-1800s. Life insurance was newly popular. While Charlotte killed her husband to “marry up,” others killed family members to get their policy payouts. They often used arsenic. From 1839-1849 alone, courts tried 239 people for murder or attempted murder using arsenic. Arsenic is a naturally occurring metal that’s harmless until combined with other elements. The poison we think of is “white arsenic,” or arsenic trioxide. Europeans knew of it since at least the first century AD, when Greek physician Dioscorides described its use as a poison. Long called the “king of poisons,” it has no color, odor or taste. A pea-sized dose causes convulsions, diarrhea, vomiting and often death from shock. Small doses over time kill subtly, causing confusion, loss of strength and eventually paralysis and death. But in Victorian Britain, you didn’t have to be a murder victim to die of arsenic. It was employed as a fly and rat killer, a skin salve and a tonic. It was used to process grain and sheep’s wool. It was a coloring for carpets and wallpaper, food and cigarette wrappers, books and children’s toys. At the height of its global empire, Britain was poisoning itself en masse. “It is likely that such constant exposure contributed much to the chronic ill-health of the period,” writes legal researcher Peter Bartrip. But what captured the public’s imagination and led to calls for reform were the murders of people like Henry Marchant, at home and abroad. Newspapers breathlessly covered the sensational trial of Marie Lafarge in France: She was convicted of murdering her husband with arsenic in 1840, and imprisoned. She was later released by Emperor Napoleon III, whose uncle Napoleon I may have died of arsenic poisoning in 1821 himself! Around this time, the people who prepared and sold medicines in Britain— the “chemists” and “druggists” — banded together, forming the Pharmaceutical Society in 1841. They wanted the government to unite their two professions and require strict qualifications for practitioners, so they could monopolize the trade and raise their status and earning potential. They felt they could realize this goal by exploiting the hot-button issue of arsenic poisoning. As a result of the society’s lobbying, Parliament passed the 1851 Arsenic Act. It required sellers and buyers of arsenic and other poisons to log their transactions. If the seller didn’t know the buyer, the buyer had to be accompanied by a witness. But fatally, the act didn’t require that the seller be a chemist or druggist. That legal loophole closed in 1868, with the Pharmacy and Poisons Act. It required labels on 15 poisons and said only registered professionals could sell them. It empowered the Pharmaceutical Society to sue offenders. Registered and illegal sellers still kept flouting various aspects of the law, but arsenic poisonings did drop significantly after the act was passed. But what the act really did was finally cement and regulate the trade of chemists and druggists — under the umbrella of what we now call pharmacy. “I do think it is gloriously ironic that it was from all these poisonings, accidents and murders that the modern, legitimate business of pharmacy emerged,” observes Mosley.